Brazil recognizes the importance of information technology (IT) and the digital economy, but has struggled to implement a policy framework to foster the development of cloud computing. Some trade barriers to IT innovation remain in Brazil. Gaps also exist in the technology neutral and non-discriminatory government procurement of IT. Brazil still does not have specific privacy legislation in place, and is falling behind its peers in this area. Brazil has some gaps in intellectual property protection and enforcement in areas relevant cloud computing. Although positive trends are present, there is room for improvement. Brazil has implemented an effective intellectual property “safe harbor” process for cloud service providers. On the other hand, the Brazilian Patent and Trademark Office has a large backlog of pending applications, which prevents patents from being issued in a timely manner. Similarly, Brazilian courts also have a large backlog of cases. However, Brazil does achieve better scores in relation to security and infrastructure, with significant improvements recorded in relation to Internet freedom in the past years. Although Brazil’s overall rank changed substantially since the last Scorecard — from 22nd to 18th — this improvement did not stem from major improvements in Brazil’s policy or IT infrastructure development. Rather, this change was caused mostly from the rebalancing of the Scorecard methodology to reflect the developments that have occurred since the Scorecard was first launched and by other countries’ poorer performance in the areas relevant to cloud computing that are reflected in the Scorecard. 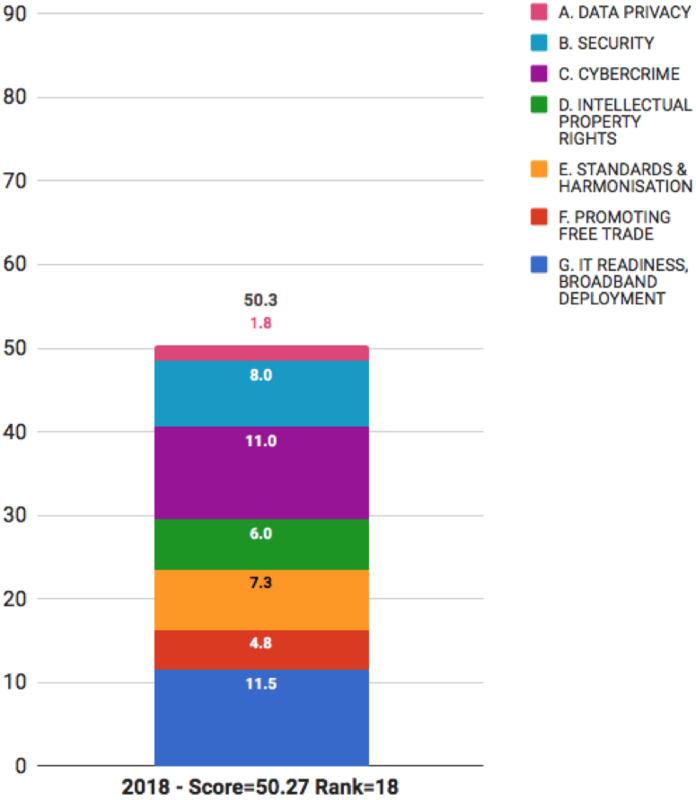 - 16th for IT readiness and broadband deployment.